In the final part of 3 part series of Arashiyama. I will be closing this with my favorite view spots in Kyoto. Togetsukyo Bridge literary means Moon crossing bridge. It was built during the Heian period and reconstructed in 1930s. This bridge is famous because of its forested mountain and river background. It is also a link between Arashiyama tram station and Arashiyama JR station. On a typical weekend, do expect to see huge crowd crossing that bridge. You will see police officers directing the traffic, PA systems reminding tourists not to stop for pictures in different languages. Was in time for a crew to row their boat over. It was really beautiful even without the autumn trees as setting. By following the river path, you will be volunteering yourself to go on a hike up the mountain. I was not sure what I would be heading into. It was not planned. In fact, I rushed through the day’s plan as I wanted to travel to Kiyomizudera as the day that I planned to go would be affected by rain. I was glad that I stayed on the path. The view was breathtaking. I saw a few artists admiring the beauty and painting. One artist was really good but I did not talk to her. 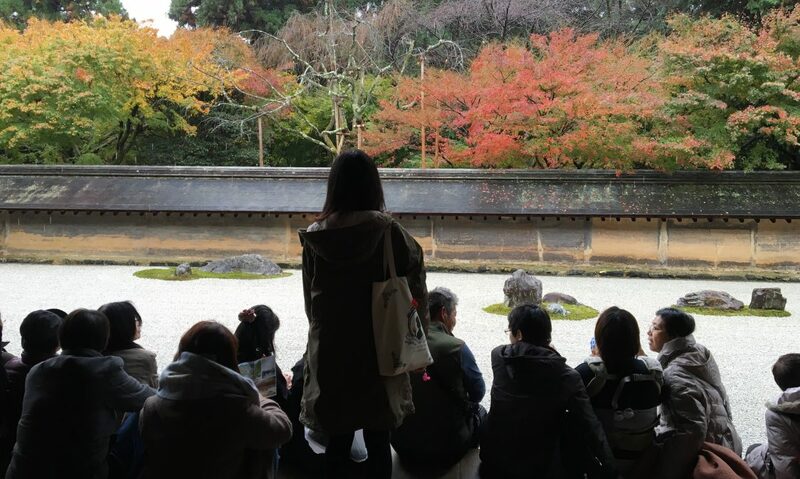 By walking up for another 20-30minutes, you will reach Daihikaku Senkoji temple. This place has the best view of Arashiyama nature. The air was really refreshing and I even took some time to take a seat, look at facebook and text my friends about my trip. After that, going down was not that tough. Finally caught up with my breath. There was not much of air up at that temple by the way. If you have the time and you are at Arashiyama, do not miss this famous Arabica coffee house at Arashiyama. It can be easily identified as the shop is very unique. Spent a few hours walking to and fro the bamboo forest as I wanted to catch the night forest unfortunately, its only open for a certain period. In the end, I went straight to Arashiyama tram station to shop. They have a kimono exhibit at the station.